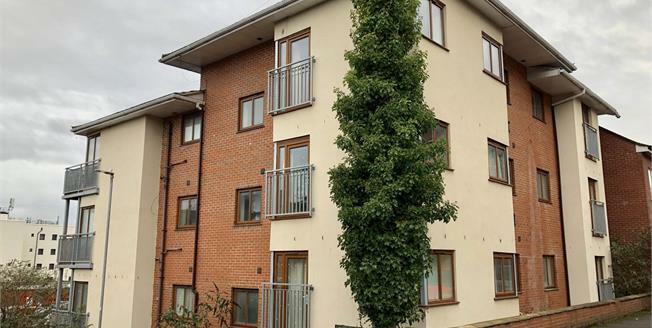 Modern two bedroom second floor apartment with spacious accommodation comprising: entrance porch and hallway, open plan lounge/dining/kitchen, master bedroom with en suite, second bedroom and bathroom. The property is being offered for sale with no upward chain. To the kitchen area Range of units at eye and base level, roll edge work surface over housing a one and a half sink and drainer with tiled splash backs, double glazed window, electric hob, stainless steel splash back, extractor hood above, space for appliances, spotlights, tile effect laminate flooring. To the lounge area Double glazed windows and patio door with Juliet style balcony, two wall mounted heaters, spotlights, wood effect flooring. Double glazed French doors with Juliette style balcony, wall mounted heater, spotlights, wooden style laminate flooring. Shower enclosure, pedestal wash hand basin, low level WC, towel radiator, extractor, light point. Double glazed window, wall mounted heater, spotlights, wooden style laminate flooring. Panel bath with shower over, pedestal wash hand basin, low level WC, towel radiator, extractor, light point.